Whey Protein Concentrate‡, Coconut Powder (coconut oil, sodium caseinate, sugar, dipotassium phosphate, propylene glycol esters of fatty acids, mono and diglycerides, sodium silicoaluminate, soy lecithin, carrageenan), Fructose, Natural and Artificial Flavors, Cocoa, Potassium Chloride, Guar Gum, Sucralose. Whey Protein Concentrate‡, Coconut Powder (coconut oil, sodium caseinate, sugar, dipotassium phosphate, propylene glycol esters of fatty acids, mono and diglycerides, sodium silicoaluminate, soy lecithin, carrageenan), Fructose, Natural and Artificial Flavors, Potassium Chloride, Cookie Bits (enriched flour, sugar, vegetable shortening, cocoa, high fructose corn syrup, corn flour, chocolate, salt, dextrose, baking soda, lecithin), Guar Gum, Sucralose. Whey Protein Concentrate‡, Coconut Powder (coconut oil, sodium caseinate, sugar, dipotassium phosphate, propylene glycol esters of fatty acids, mono and diglycerides, sodium silicoaluminate, soy lecithin, carrageenan), Cocoa, Fructose, Natural and Artificial Flavors, Potassium Chloride, Guar Gum, Sucralose. Whey Protein Concentrate‡, Coconut Powder (coconut oil, sodium caseinate, sugar, dipotassium phosphate, propylene glycol esters of fatty acids, mono and diglycerides, sodium silicoaluminate, soy lecithin, carrageenan), Fructose, Natural and Artificial Flavors, Potassium Chloride, Guar Gum, Sucralose. Whey Protein Concentrate‡, Coconut Powder (coconut oil, sodium caseinate, sugar, dipotassium phosphate, propylene glycol esters of fatty acids, mono- and diglycerides, sodium silicoaluminate, soy lecithin, carrageenan), Fructose, Natural and Artificial Flavors, Cocoa, Potassium Chloride, Guar Gum, Sucralose. The world's first high performance whey protein that tastes so amazing you won't believe you are drinking a protein shake. An ultra-pure blend of premium whey protein, lo-glycemic index carbs, and an ample supply of MCT's...mixes easily and has an incredible real milk shake taste. Simply Put...The Name Speaks For Itself. TastyWHEY is a high protein supplement mix that provides exceptional nutrition. It promotes peak wellness by use of a proprietary combination of exceptionally high quality whey protein along with MCTs, low glycemic index carbohydrates and micronutrients AND with an AWESOME taste too! 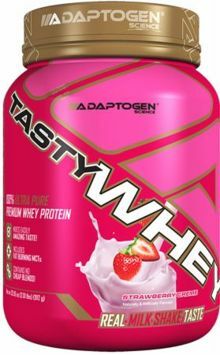 After years of research and development, Adaptogen Science has finally developed what we consider the most complete and best tasting protein on the market…appropriately named TastyWHEY. A high performance whey protein that tastes so amazing that you won't believe you are drinking a protein shake. Everyone will love this - it is a drink that will please the whole family! Real milk shake taste, incredibly mouth watering and smooth, with no protein or sweetener aftertaste. Your Body's Best Secret to Health, Wellbeing AND a Perfect body! What will you find in TastyWhey? The foundation ingredient in TastyWHEY is whey protein, considered by many to be a protein superstar, and nature's richest source of biologically active protein. TastyWHEY protein contains all of the essential amino acids. Plus it boasts the highest protein quality rating among all proteins. It is a complete protein, giving your muscles and body the building blocks it needs from the very start to stay healthy and strong.† In fact, whey protein is present in human mother's milk to help support immune function, strong bones and muscles from the first stage of life.